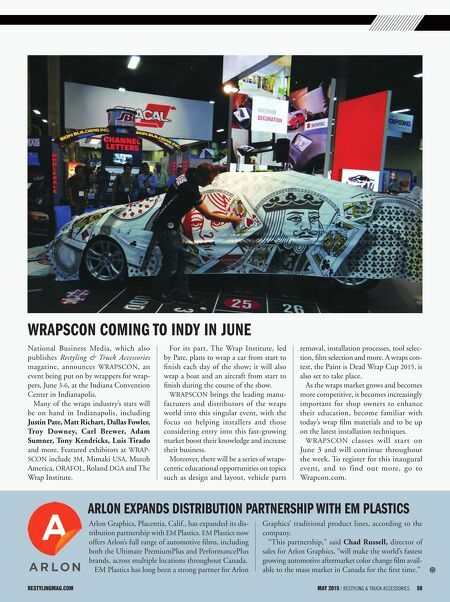 restylingmag.com May 2015 | Restyling & tRuck AccessoRies 59 restylingMag.coM May 2015 | Restyling & tRuck AccessoRies 59 Arlon ExpAnds distribution pArtnErship with EM plAstics wrApscon coMing to indy in JunE National Business Media, which also publishes Restyling & Truck Accessories magazine, announces WRAPSCON, an event being put on by wrappers for wrap- pers, June 3-6, at the Indiana Convention Center in Indianapolis. Many of the wraps industry's stars will be on hand in Indianapolis, including Justin Pate, Matt Richart, Dallas Fowler, Troy Downey, Carl Brewer, Adam Sumner, Tony Kendricks, Luis Tirado and more. Featured exhibitors at WRAP- SCON include 3M, Mimaki USA, Mutoh America, ORAFOL, Roland DGA and The Wrap Institute. For its part, The Wrap Institute, led by Pate, plans to wrap a car from start to finish each day of the show; it will also wrap a boat and an aircraft from start to finish during the course of the show. WRAPSCON brings the leading manu- facturers and distributors of the wraps world into this singular event, with the focus on helping installers and those considering entry into this fast-growing market boost their knowledge and increase their business. 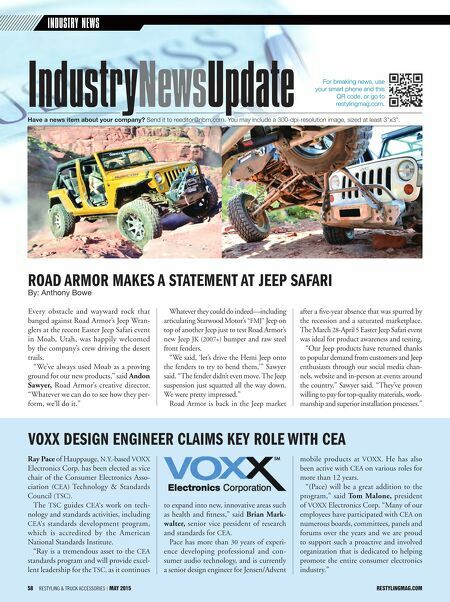 Moreover, there will be a series of wraps- centric educational opportunities on topics such as design and layout, vehicle parts removal, installation processes, tool selec- tion, film selection and more. A wraps con- test, the Paint is Dead Wrap Cup 2015, is also set to take place. As the wraps market grows and becomes more competitive, it becomes increasingly important for shop owners to enhance their education, become familiar with today's wrap film materials and to be up on the latest installation techniques. WRAPSCON classes will start on June 3 and will continue throughout the week. To register for this inaugural event, and to find out more, go to Wrapcon.com. Arlon Graphics, Placentia, Calif., has expanded its dis- tribution partnership with EM Plastics. EM Plastics now offers Arlon's full range of automotive films, including both the Ultimate PremiumPlus and PerformancePlus brands, across multiple locations throughout Canada. EM Plastics has long been a strong partner for Arlon Graphics' traditional product lines, according to the company. "This partnership," said Chad Russell, director of sales for Arlon Graphics, "will make the world's fastest growing automotive aftermarket color change film avail- able to the mass market in Canada for the first time."